In 1993, a study was conducted in Washington, D.C. to demonstrate the effectiveness of meditation in lowering crime rates. A group of meditation students would meditate to lower the crime rate in the city. Skeptics, including the D.C. Chief of Police, claimed the meditation would have no effect. The statistical probability of this occurrence was less than two in a billion. With 800 – 4,000 people focused on meditating for peace, a major city was dramatically affected by the energy. 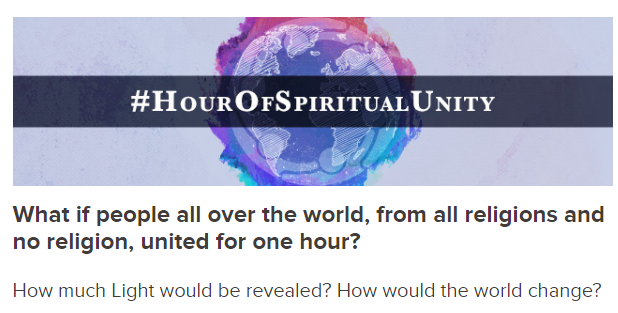 With this in mind, major world spiritual leaders are calling for an hour of spiritual unity today. “It has been my dream that one day, barriers will be removed between people, and that we will find respect for each other’s spiritual practices and beliefs. For holy books from different traditions may contain different words but the message remains the same: To love each other, to love ourselves, and to grow our love and awe for the Infinite Force that is all around us and gives us life. Indeed, unity can be the foundation of our differences. Karen Berg’s call to action commences tonight, Monday, March 27th, on the lunar New Year, also known as the New Moon of Aries. For centuries, experts of various disciplines have recognized the value of taking action on the New Moon, and the New Moon of Aries is said to be the seed level of the new year. Berg is joined in her call for peace by spiritual leaders from around the world, including Sheikh Dr. Muhammed Al-Hussaini, Dr. Bawa Jain, Secretary-General of The Millennium World Peace Summit of Religious and Spiritual Leaders, and Ilchi Lee, founder of Brain & Body Yoga. With all the chaos of bombings and terrorist attacks that pervaded last week and last year, now is the perfect time for people across the globe to unite, and use our energy to make a dramatic impact for good. Let our brainwaves generate peace around the world, and positively influence all mankind.